Acknowledgement to MARIA KAY SIMMS for her work on this. The only constant in life is change. Nothing is static. From the tiniest cell to the most complex organism, the cycle continues -- life, growth, deterioration, death and life, again. In planetary symbolism we associate the Moon with change, in reflection of her constantly changing faces it the waxing and waning of her cycle. Four of the Moon's faces are well known, and many calendars mark those lunar phases: New Moon, First Quarter, Full Moon, and Last Quarter. 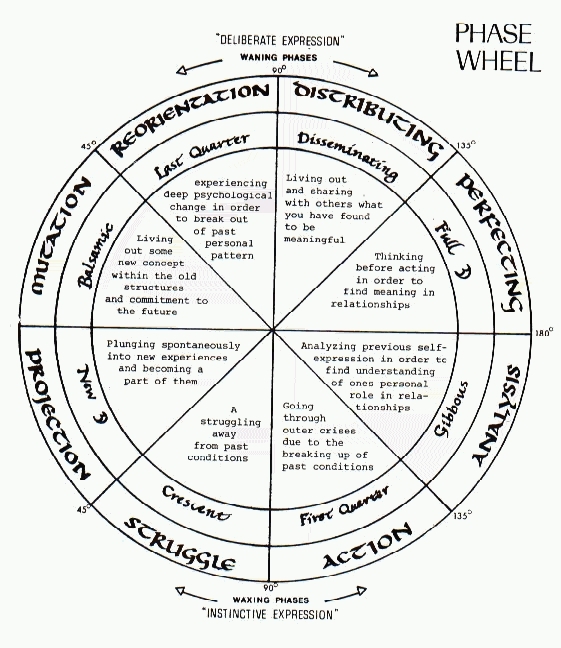 Not as familiar are the four cross-quarter phases, as described by the great astrologer-philosopher Dane Rudhyar in his 1967 book The Lunation Cycle. These four are: Crescent, Gibbous, Disseminating and Balsamic. All together then, we have a cycle of eight -- a cycle of transformation that we can see reflected in our lives. we have a basic natal "type" according to the lunar phase in our birth chart and we go through a lifetime of phases as defined by secondary progressions. To some extent we might also relate our day-to-day activities to lunar phases, although lunar transits go by so quickly that most people pay little attention to anything but New Moon and Full Moon. . . .the closest Moon phase before your birthday . . . is your natal Moon phase and its mythology and symbolism should be meaningful to you in terms of the life purpose suggested by your Sun. The brief delineations given here are, of course, generalized, and will be colored by the sign of your Sun and modified by other factors in your chart. Your progressed lunar phase should give you insight into major transformative cycles within your lifetime. The progressed lunar phase is the aspect of Progressed Moon to Progressed Sun. It is found, in general, by counting one day forward in the ephemeris for each year of life -- you should also be able to figure this out from the table [above]. A complete progressed Moon cycle, from New Moon to New Moon again takes approximately 29 years . . .
New Moon - This is the dark of the Moon. Conjunct the Sun, she is, of course, not visible in the night sky. . .The New Moon-born individual projects the self on the world with a sense of creative new beginning brought forth largely through instinct or sheer impulse. Here is one who operates best when meeting the challenge of the moment dynamically, often dramatically, who moves forward with the urge to get things going -- but may not yet have the process well thought through . . . When you are at the Progressed New Moon some new creative energy is released that marks the beginning of a major new cycle of your life. But it is not yet firmly established, and it is not yet certain just how it will develop. Often an event (or events) will occur at this time that "marks" the new cycle -- but you may not even be aware of its importance until you look back on it later. This is a time of gradual awakening to new goals. It is not yet a definite break with the past, but it is a time when old familiar patterns seem to lack vitality and you instinctively feel a sense of creative new beginnings. Crescent - In the monthly lunar cycle this is the time when the first silvery crescent of light appears in the sky -- the newborn light begins to manifest. . .You who are born at the Crescent Moon feel a strong impulse toward action, yet seem forever to be involved in intense challenges. In one way or another you are trying to break with traditions of the past. You may be involved in change from one class to another, or perhaps in the attempt to break away from family expectations, or to improve your status. In some way or another you represent the new in perpetual struggle against the old. At the time of your Progressed Crescent Moon the new beginnings that were released at Progressed New Moon begin to crystallize and take form. You are challenged to carry forward, but in order to do so, you may have to break from something in the past. First Quarter - Half of the Moon is now visible at night, a balance between dark and light . . . This phase of the lunar cycle has been called the crisis of action. You who are born during this phase may feel that your life is one crisis after another. You are attracted to action, noise, and movement because you sense in yourself a constant urge to get going -- to progress -- even if the end goal you are moving toward is just a bit hazy. You feel that you have to clear away old forms or structures that you perceive as obstacles, so that you can create new ones. You are strong willed and are likely to develop skills in management. Progressed First Quarter brings a crisis of action in the new direction that you are establishing in your life. This is the time to make it happen -- to be aggressive in pursuing your goals. If there is anything from your past that is holding you back, this is the time to resolve that issue and clear it away once and for all. Gibbous - The Moon in the sky is increasing in light, but not yet full . . .You who are Gibbous-born give much attention to self-discovery. You are developing your capacity for personal growth in your deisre to make your lives something of value. You constantly evaluate -- constantly ask "why" -- where you are going, how you are growing, what you are doing that has significance. Nothing is taken for granted. It is important to you to make things clear, to discover better ways of doing things. You could become caught up working for a cause. At the Progressed Gibbous Moon you are challenged to perfect the methods of your new direction in life. You could call this the period of apprenticeship. Your new direction is established but not yet fulfilled. This is a stage of development in which you must analyze your growth and reorganize or improve your techniques so that you can grow beyond technique and reach out for true fulfillment. Full Moon - The Moon now shines opposite in the zodiac from the Sun reflecting his light in all her fullness . . . As the Full Moon stands at polar opposite to the Sun, so will the Full Moon-born be strongly involved in issues of relationship. Long before the realization sets in that the true completion is within the self, you may go through considerable crises in your relationships with others. Perhaps more than with the other phase types, it is through relationships that you will achieve objectivity and clarity about your own purpose. And it is the discovery of purpose that is paramount. Fulfillment -- even abundance -- is not enough. You must find illumination, a worthwhile reason for your life. Progressed Full Moon is a fulfillment or climax of the new direction that began about 14-15 years ago at your Progressed New Moon. It's a high period. The new structures you've been building work! Now what? As at Summer Solstice, the light triumphs . . . but does that also mean that now there's only one way to go -- into decline? Is further growth possible? A bit scary, isn't it? It is important at this time to pause for illumination, to consider the meaning or purpose for what you are doing. And also to integrate any opposing issues from within or without. If there is no illumination, your vitality and enthusiasm for what you are doing is likely to wane and the structures begin to crumble as your direction loses clarity. But if what you have built is truly meaningful, you have much to give back to the world in the coming phase. Disseminating - The round Moon is now a bit flat on one side, but still bright in the sky . . . Ilumination is reached at the Full Moon, and at Disseminating Moon it is spread. You, who are born at this phase, like to communicate ideas that are meaningful to you. You are a natural communicator, a born teacher. If a particular cause has become important to you, you could be quite a crusader. The main purpose for your life -- what you live for -- is to share your wisdom, your beliefs, your interests. During the period of your Progressed Disseminating Moon it is time to share with the world the fruits of your achievements of your Full Moon culmination, and more importantly, the wisdom of your illumination. This is the time to teach what you've learned. Once again the Moon is half light and dark . . .
Last Quarter is the time of crisis in consciousness and you who are born under this phase know deep inside yourself that somehow you do not "fit in" with the accepted way. You are likely to seem different on the surface (to others) than what is really germinating inside. You could even seem inflexible to others, for you will, on the surface, stick to established structures and patterns because you are not yet ready to "come out" with your reorientation. At times when your progressions may indicate you are ready, a "new you" may come suddenly to the surface, surprising others who did not realize the changes that were going on inside you. At Progressed Last Quarter you will experience some crises of consciousness that will lead you away from the dominant activities of your current progressed lunar cycle and will begin to prepare you for a new direction at the next Progressed New Moon. You may begin to resist previous ways of doing things because it seems that somehow they no longer serve you. What was to be accomplished since the last New Moon has been done. Deep inside you something new is germinating, even though on the surface you may not show this to others. Balsamic - Only a sliver of light now remains in the night sky - the waning Crescent Moon . . . As a Balsamic born, you could be one who seems somehow out-of-sync with the majority, one about whom it could be said "listens to the beat of a different drummer." You may have a sense of the prophet about you. You are sure that you have a special destiny but are not too clear on just what it is or where you are going, but you are ready to flow with it. Many experience the Progressed Balsamic Moon period as a true "dark of the moon," but it should not be looked upon as a fallow period when nothing is accomplished You will probably try several new starts in your attempt to reach out for your new cycle. Some of them will fall by the wayside, but others -- or one -- will prove to be the successful conception of the new cycle. Do not mourn for what has ended -- it has served its purpose. Know that every ending is the seed of a new beginning. The wheel keeps turning. 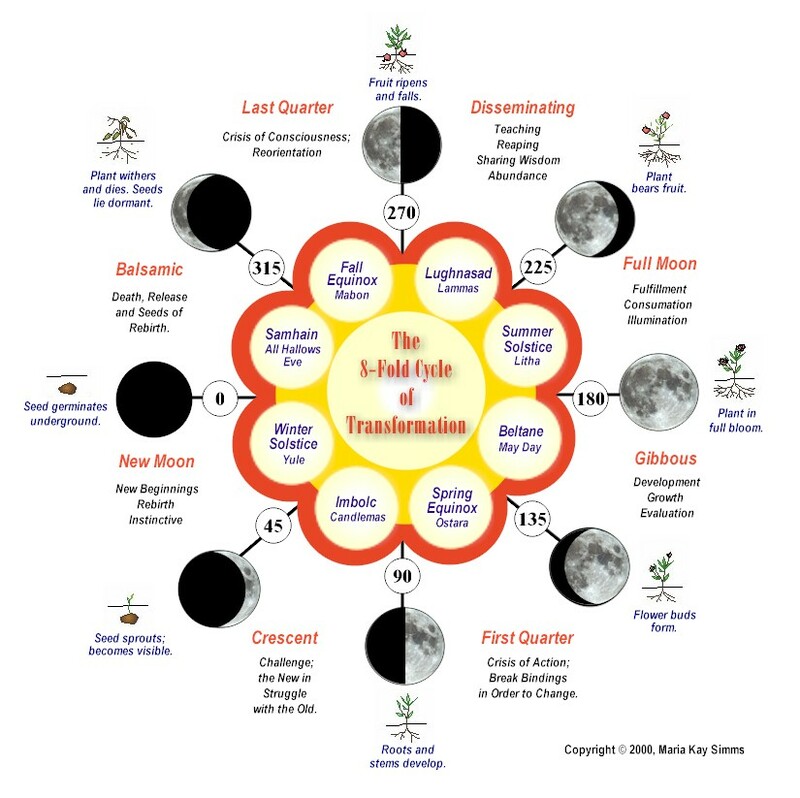 Adapted from Maria Kay Simms' The Eight-Fold Cycle of Transformation, which is an article accompanying the lunar phase tables in Neil F. Michelsen's Tables of Planetary Phenomena." Are you looking to use a web host? or looking for the best price in town for your web page? Well look no more. I use NETFIRMS for all my web need's. What you see on this page is what they offer for a FREE service, then for a small cost of 4.95 a month you can get a page without the banners. So if your looking, clicking the banner and see why NETFIRMS is the leading choice.